Super Famicom games can be played on your SNES with a little work. Note 1: Like Final Fight games? Check out my reviews of Mighty Final Fight and Final Fight Guy. Also, check out my other Beat ‘Em Up reviews for Warriors of Fate, Double Dragon II, D & D, Bare Knuckle 3, and Nekketsu Oyako! Note 2: This game was played on a Super Nintendo Entertainment System. Although the game was released in Japan for the Super Famicom (Japanese SNES), it will play on the original model U.S. Super Nintendo IF you remove the two plastic tabs inside the SNES’ cartridge slot. The game cannot be inserted with the tabs in place. I removed the tabs in my SNES with a pair of needle-nosed pliers – it took about 10 minutes – now I can play all Super Famicom games from Japan! The SNES was connected to a 32-inch tv via an S-Video cable. Quick History: Released in 1993, Final Fight 2 is the Beat ‘Em Up sequel to the popular arcade game, Final Fight (which was later ported to various home game consoles, like the SNES). 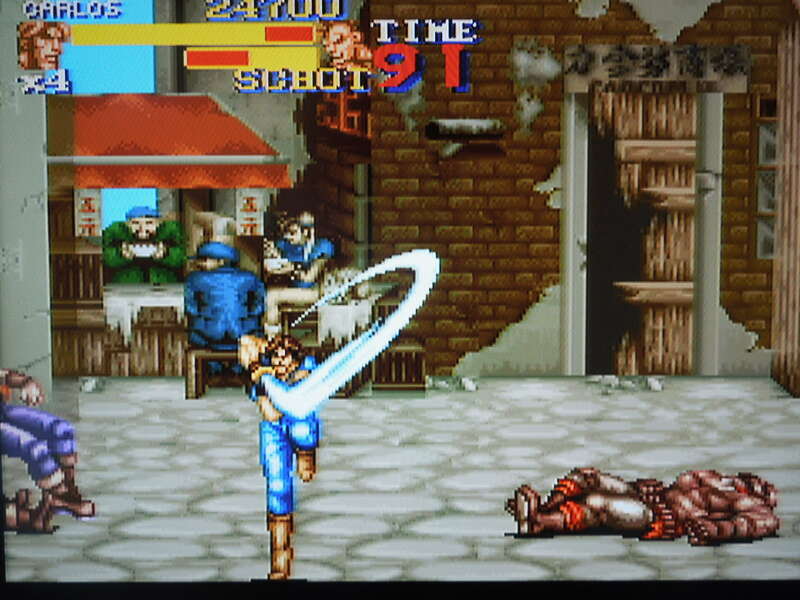 Unlike the first game, Final Fight 2 is not based on an arcade game. Instead, it was released exclusively for the Super Nintendo (known as the Super Famicom in Japan). 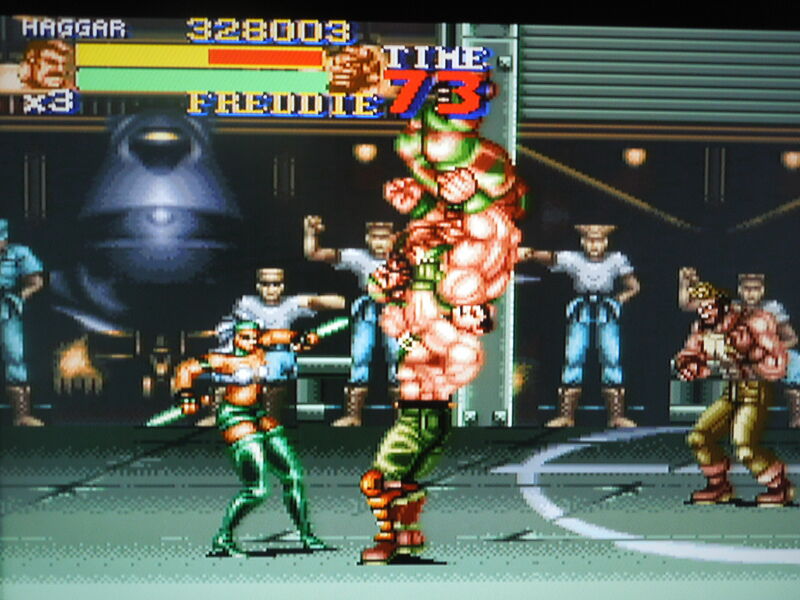 Despite the game’s release in both regions – the U.S. and Japan – the game was ‘censored’ somewhat when released in the U.S., much like the original Final Fight. This review is for the uncensored Japanese version of Final Fight 2. Story: After the events of the original Final Fight, when Mayor Haggar, Guy, and Cody defeated the Mad Gear gang, the gang has resurfaced abroad. The newly-reformed Mad Gear kidnap Guy’s finacee, Rena, and her father. Now, Mayor Haggar, Maki (Rena’s sister), and Carlos (Haggar’s friend) hop a plane to Hong Kong to confront the gang members. Cody and Guy are conspicuously absent in the game. Fight through 6 international stages in order to rescue the kidnapped Rena. Control: Y punches. B jumps. B + Y executes your special attack, which drains some of your energy if you connect. You can change your special to a solitary button, like button A, in the Options menu. Getting in close to an enemy causes you to grab him or her automatically. With a grabbed enemy, pressing Y headbutts or knees him or her, depending on which character you’ve chosen. With a grabbed enemy, pressing Y + left or right will throw him or her. Additionally, using Haggar, if you press B to jump with a grabbed enemy followed by Y, you’ll execute a devastating spinning pile driver. Also, Maki can jump off walls with a flying kick if you jump toward a wall a press Y. Characters: Select Haggar, Carlos, or Maki to play through the game with. You can change characters during gameplay if you lose all of your lives and continue. Haggar is slower and stronger. Carlos is more of the average character, with balanced speed and strength. Maki is quicker, yet weaker. Boss fights always involve other gang members getting involved. Gameplay: After selecting your character, you must fight your way through 6 international stages in order to confront the new leader of the Mad Gear. The stages are: Hong Kong, France, Holland, England, Italy, and Japan. You must fight wave after wave of gang members as you walk through each stage, culminating with a boss at the end. 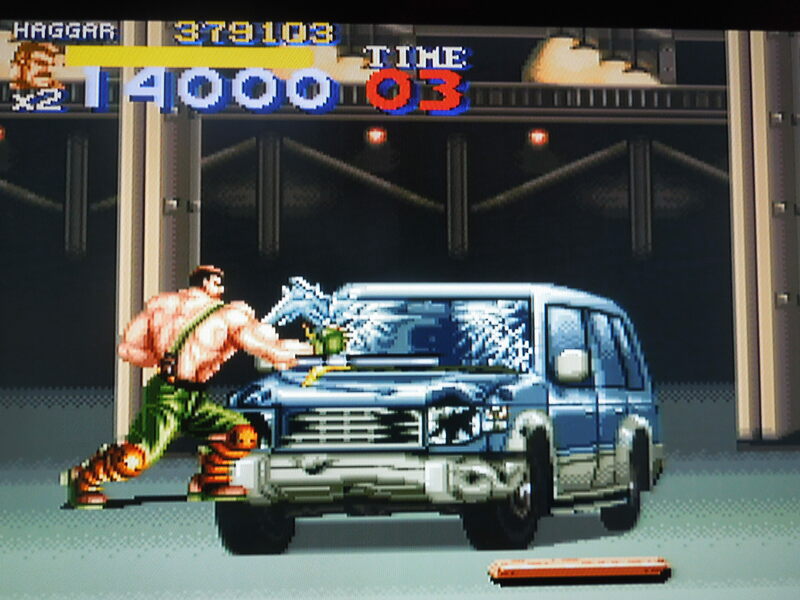 Music and Sound: Some familiar tunes from the original Final Fight can be heard, in addition to new tracks. Overall, the music is decent and the sound effects are slightly above average, too. Punches, kicks, and throws all sound satisfying. Options: In the Options menu, you can set the difficulty from Easy, Normal, Hard, and Expert. You get a better ending by beating the game on the ‘Expert’ setting. 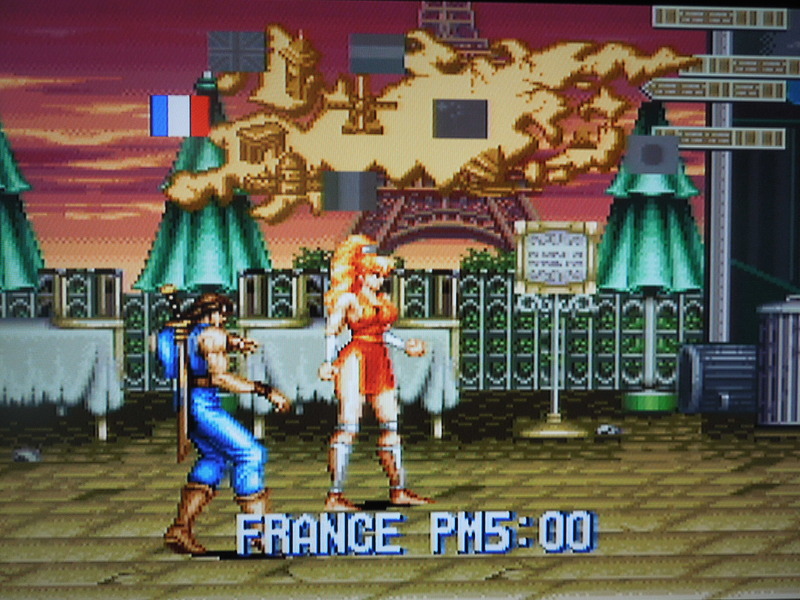 Differences in Japan version and U.S. version of Final Fight 2: While some smaller graphical changes were made to the U.S. version, like the removal of the ‘peace’ logo in the France stage, here are the most notable differences. (1) In the Japanese version, Won Won, the game’s first boss, fights with a meat cleaver in hand – he will use it to attack you, of course. In the U.S. version, Won Won doesn’t have the meat cleaver, and he fights bare-handed. (2) In the Japanese version, there are 2 female gang members, Mary and Eliza. In the U.S. version, however, these 2 females were removed and replaced with male gang members – Leon and Robert. Female gang members, like the one seen here, were only found in the Japanese version of Final Fight 2. Language Barrier? Yes and No. No, if you just want to enjoy playing an arcade-style Beat ‘Em Up. The Options menu, character names, and stages are all in English. The story, however, that plays during the game’s introduction and in-between stages, is in Japanese. 2 player co-op: This is something that was missing from the SNES/Super Famicom version of the original Final Fight, but fortunately, is now in place. 2-player co-op requires both characters to share the limited number of continues, and the characters can strike one another as well, so you’ll have to be careful. Extra Lives, Weapons and Health Pick-ups: You gain extra lives at 100,000 points, and then again at every 200,000 points after that. Also, you can replenish your energy by breaking open barrels and eating the food you find there. You’ll also occasionally find knives, clubs, and 2 by 4’s to use on enemies. So, where can I find this game? I believe the U.S. version is downloadable on the Virtual Console service. You can buy either the Super Nintendo or Super Famicom version on eBay, or you can play the rom on a computer emulator. Occasional bonus stages allow you to wrack up points for extra lives. Conclusion: Final Fight 2 is amazingly similar to its predecessor, Final Fight. The control scheme, which has not changed, is amazingly simple to master. Having 3 selectable characters, each which handle a bit differently, is a nice option. 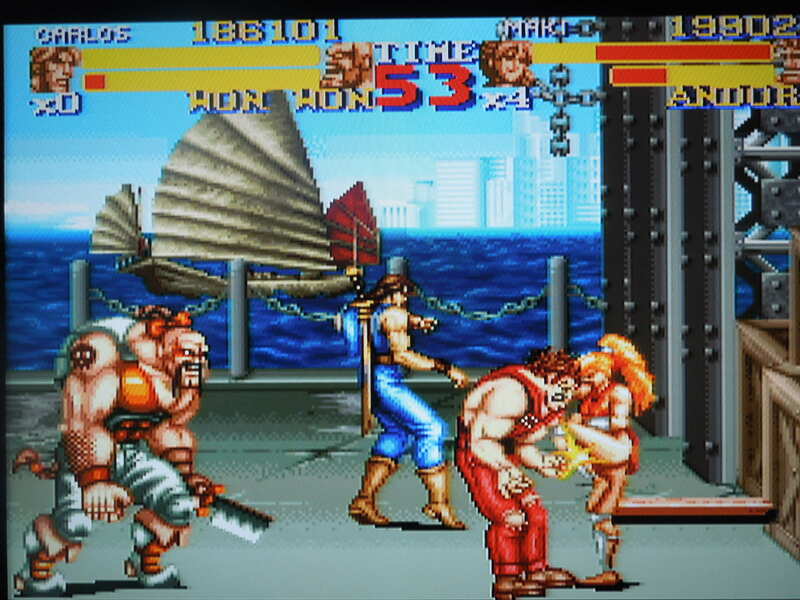 2 player co-op is excellent in Final Fight 2, although you’ll have to be careful to keep your distant from your partner. Beating the game on Expert presents a tough challenge. 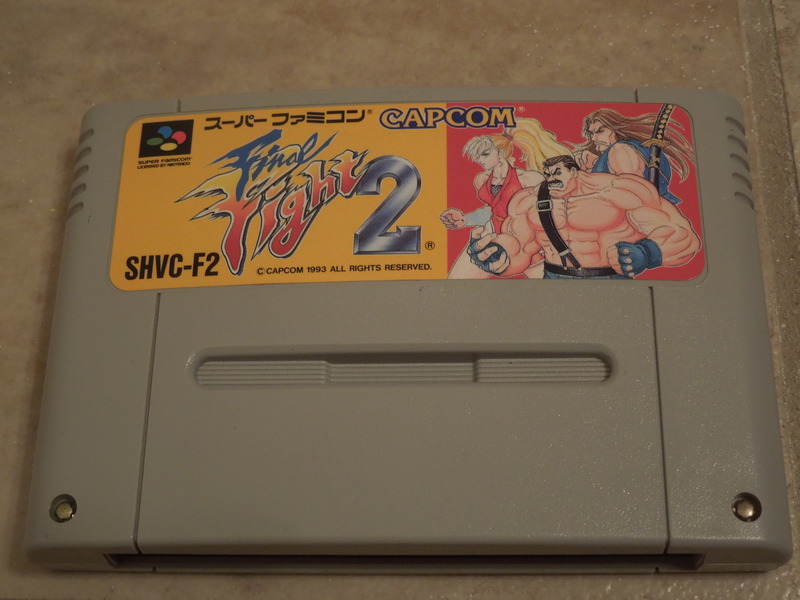 This entry was posted in Super Famicom - Final Fight 2 and tagged Final Fight 2 Super Famicom Review. Bookmark the permalink.